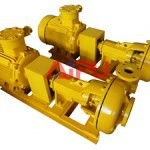 How to improve sand pump work efficiency? 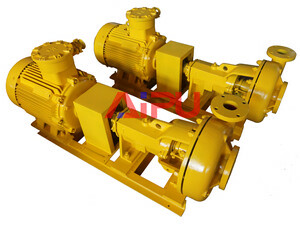 Sand pump is also called centrifugal pump, since its working principle is according to centrifugal force. sand pump is power source for desander, desilter , swirl mixer in drilling mud solids control system. Therefore, work efficiency of sand pump will directly influence the whole drilling mud processing system work efficiency. Increase hydrocyclone quantity or start more mud agitators will be request to enhance power. Speed increased will lead to head increased, and then capacity increased. Sand pump wear means to lower impeller performance, so capacity, head and power will be reduced. After start motor, if the load is small, it may cause an overload. At this time, when start we should close the discharge valve and then slowly open the discharge valve after starting. Usually according to solids control equipment treating Max.density of drilling mud to choose pump power, or choosing a little larger motor ensure that are not overloaded in maximum aggravating drilling fluid case. Aipu machinery through fully considering if matched equipment can work in best condition to design and pump parameter, most of the parts can be interchangeable, easy to operate and maintain, less leakage for oil seal, reliable work, long service life etc. How to choose a suitable mud agitator? What affects shale shaker performance?